This 26' Prowler Cat is powered by fuel-efficient and reliable 4 stroke engines. Our boats are designed for comfort. It's equipped with a full Bimini for extensive shade coverage, as well as coolers, ample dry storage and freshwater showers for your convenience. Ice and a cooler of drink included! Mathias, a native of Germany, is the owner and operator. Mathias arrived in the U.S. Virgin Islands in the early 1980’s to work for a family owned business. Mathias is available to help answer any questions you may have about your boat rental. 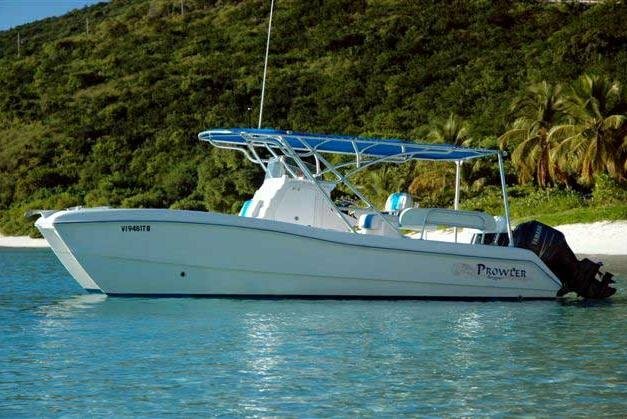 He has over 25 years experience in the Virgin Islands boating industry. Thomas was born and raised in St. Thomas, US Virgin Islands. Thomas grew up on boats and has been boating the Virgin Islands his entire life. He has a deep love and extensive knowledge of the best boating spots and shares that expertise each day with charter guests. He is a natural on the water. His life revolves around friends, family and his passion for the beautiful Virgin Islands. Thomas is a certified USCG captain with a Masters 50 ton license. An avid free diver, Thomas has FII Level 1 certification. Also don't be surprised when he breaks the surface carrying a grilling item for the night’s dinner. Raymond, born in St. Thomas and raised in both St. Thomas and Puerto Rico, is one of the most charismatic and professional captains you will ever meet. Raymond has been cruising the U.S. and British Virgin Islands waters for more than 17 years, guiding visitors on leisurely day trips and fishing charters. While he knows how to navigate all sea conditions, Raymond’s vivacious and outgoing personality is why his guests keep coming back. During his years touring the BVI, Raymond has forged deep relationships to help you breeze through the check-in and check-out process. Raymond is fluent in Spanish, a certified USCG captain with a Masters 100 ton license, and an avid diver with rescue diver certification. Shawn, a St. Thomas native, grew up fishing on the north side of St. Thomas. Shawn’s experiences around the US and BVI waters runs deep. He has a natural, laid-back sense for making each guest feel like they are chillin’ in paradise. When not at the helm you can find him zipping around the waters of St. Thomas or competing in a USVI or BVI fishing tournament. Shawn is a certified USCG captain with a Masters 50 ton license. Daniel moved to the Virgin Islands in 2003 and since then has been immersed in the Virgin Islands boating world. A world traveler, Daniel is an avid sailor and has over a decade of charter yacht experience. Daniel is a certified USCG captain with a Masters 100 ton license. Nicolle was born and raised in St. Thomas, US Virgin Islands. When she is not off Island studying at college, she is back home and out on the beautiful Virgin Island waters having fun! Nicolle is a certified USCG captain with a six passenger license.